Many brands are just starting to grapple with the first wave of digital disruption, that they aren’t fully conscious of the perpetual disruption that’s happening to the media space. The cliches of acceleration and ever faster cycles are somewhat real as the combination of excess capital meets ideas. Of course, not all of these ideas will survive, as Rick Webb points out in his great post, where he does some math to calculate that there’s only enough ad dollars to allow for 9 more Googles, so all the talk of a bubble is for real. Follow Webb’s logic and it’s clear that most will not survive, but a few will and those with a powerful enough idea will hold their own or form the rocket fuel for the latest generation of media giants, who are finding themselves less capable of organic growth, than they once were. 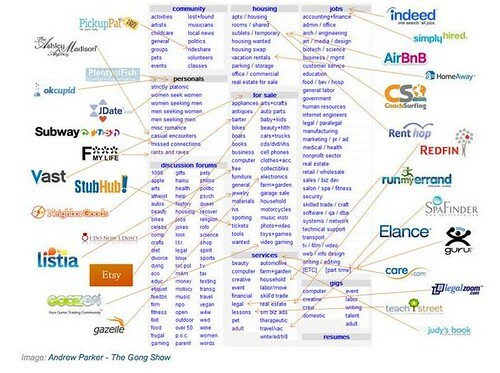 It’s easy to forget that Craigslist is fast becoming old media with these new time frames and I thought the graphic (from the Gongshow) made a nice point about how the niches are nibbling away at the core of Craigslist. Media is changing in a multitude of ways with significant impacts for everyone, there was a time when you could put digital in a nice box and deal with on its own- now everything is digital and it’s all folding together. 1. You need nearsight and foresight- understand and be clear on the current status quo and have a POV on what’s next? 5. Understand behaviors across media- understand from the earliest adopters to your target, how their usage habits are being transformed and use the insight to inform your thinking-what are the opportunities that can be exploited?